Forget Me Not memorial jewellery is designed and manufactured by Touchstone Jewellery Ltd in Birmingham, England. All pieces are hand-made by skilled craftsmen from start to finish in the UK and are appropriately hallmarked with the anchor mark of the Birmingham Assay Office. We are so proud of our range, we have given it its own website! 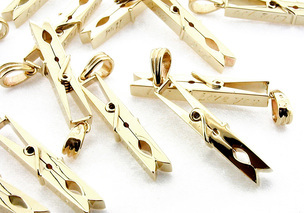 It all started many years ago when a customer came into the shop and ordered 17 small 9ct yellow clothes pegs to be made as pendants. These pendants were to be engraved with family members names. Although they were not designed to hold ashes they were a symbol for their "Auntie Peggy" who had sadly passed away. This gave us the idea to produce lockets and various other containers which the customer could wear or just keep in a bag or pocket as a keepsake allowing them to carry a small amount of their loved ones ashes in a piece of beautiful handmade jewellery in either sterling silver, gold or platinum. We have a wide range of pendants, crosses and bracelets designed for this purpose and are happy to make something different if you want that special bespoke keepsake item. Most of the jewellery can be personalised, with engraving at an additional cost, such as a name, date or something personal to the family. All the items are "British Made" on the premises by skilled craftsmen and carry the Birmingham Assay Hallmark.